There is tons (literally!) of breadfruit that is not being harvested and eaten in Hawai‘i. A Hawai‘i Homegrown Food Network survey found that about half of the breadfruit grown by is not utilized. Many of Hawai‘i’s families are food insecure—lacking access to affordable and nutritious food. 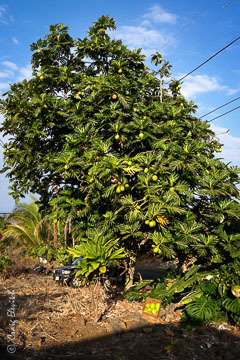 Breadfruit (‘ulu) is a traditional staple crop throughout the Pacific region. It is a local, abundant and nutritious food that can be used to alleviate hunger in Hawai‘i. In its first month of operation (January–February 2013) Breadfruit Harvest for Hunger has harvested, distributed and processed over 500 pounds of breadfruit. 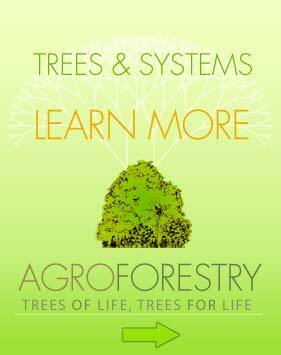 The project builds relationships with landowners who have excess breadfruit and forms an agreement to harvest. 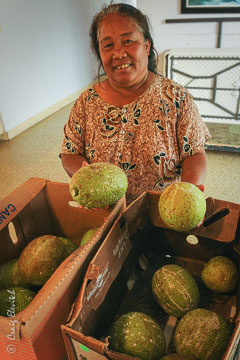 The breadfruit is then distributed through social service agencies such as the Kealakehe Meet and Eat, Ocean View Food Basket and Hawai‘i Island Youth Corps. Excess breadfruit is processed and frozen for future use by the West Hawai‘i Community College Culinary Arts Program. Much of the breadfruit in Hawai'i goes to waste. This project helps make use of fruit that would otherwise be wasted.In order to help develop the market for breadfruit, the project is also studying the viability of breadfruit as a replacement for imported starches by comparing it to other local and imported carbohydrate staples based on priceand nutritional value delivered. We are working with chefs to identify and address the barriers to breadfruit being more commonly utilized in restaurants. The Breadfruit Harvest for Hunger project is funded through the Omidyar ‘Ohana Fund of the Hawai‘i Community Foundation. Ho'oulu ka 'Ulu is a project of the Hawai'i Homegrown Food Network (HHFN) and the Breadfruit Institute (BFI) of the National Tropical Botanical Garden.